From 2005 to 2014 there was a 103% increase in workers that hold jobs compatible with at least some remote work, and 38% of U.S. employees allow working from home on some level. In addition, many people are finding themselves either leaving the traditional work place, either by force or by choice, and starting businesses of their own from their homes. Others rely on freelance work to make ends meet daily. Whatever type of work they do, more and more people are transitioning from traditional work situations to working from home. While it is a dream for many, it isn’t always an easy transition. In fact, it can be quite hard. Preparation will be different based on the situation. Some will continue working as an employee and be expected to keep regular hours. Others will have more flexibility in location and schedule. 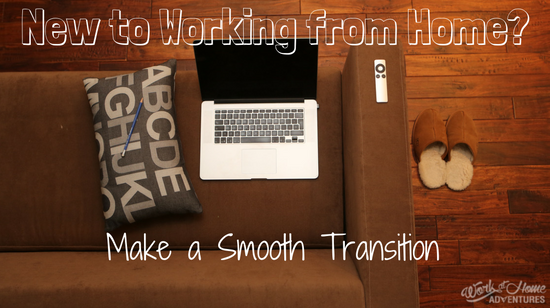 These tips can help you transition to working from home as smoothly as possible. If you are going to be working from home, you are going to need a place in your home to work. Of course, you can do this from your couch, your kitchen table, or even your bed. However, it is wise to have at least one place reserved for work alone if at all possible. This will give you a more distraction free place to work, and help in separation of work and home if needed. A corner in a room will do the trick, but if separate office space is available that is even better. Next, consider not only the equipment you need, but storage as well. You many have files upon files, a computer, a head set, tools, craft supplies, inventory, or any number of work related items. Do yourself a favor and designate a room, cabinet, or shelf for these things now. Otherwise you may quickly feel your work is taking over your home. This looks different for everyone. Those that still have to keep hours set by someone else may actually have an easier time with this. Even if you get to set your own hours, working at will, do your best to do so. It does not have to be that you work from a certain time to a certain time each day. You can set your work hours each day, or the night before for the next day. The goal is not to hold yourself to a strict schedule, but rather to separate work from home, for you and for others. You need clear boundaries to know when to work and when to stop. It may be a huge block of time at once, or it may be an hour here and there with breaks in between. The key is to plan it, at least daily, so you have something to work toward. Another way to create boundaries when working from home, in addition to a work space and schedule, is to consider ways to create the same type of separation as a commute. It may be as simple as getting dressed and then walking to the computer. Some people even drive around the block, or drive to a nearby coffee shop for coffee and then come back home to start work. Do the same thing at the end of your work day. Maybe walk to your room and change out of your work clothes, or light a candle in the kitchen and turn on the television to catch the evening news. It can be as subtle or as obvious as you need to switch gears and to help anyone else around switch gears with you. Along with work hours, you are going to need to create your own structure. There will not be a boss or other co-workers nearby to keep you on task. Doing this for yourself is harder for some than others, but those that are great at it generally do it the same way. The best way to do this is to set hours, along with breaks, and stick to them. Walk away at lunch and sit down and eat in another room. Set goals for what you want to accomplish each day and each week. Lists are also great at creating structure and direction. To-do list are a must. Electronic tools such as Google Calendar can work well for helping you create structure, with the ability to create goals and set reminders built into the program. Trello– This is great for both file sharing and creating and sharing tasks. It allows managers and co-workers to stay on the same page and see where everyone is on certain tasks from remote locations. DropBox– This file sharing program allows for sharing files with groups of people without having to blast emails with attachments constantly. Momentum– This app lets you set and track habits, routines, and goals. It is useful for not only structure but also helps provide accountability. In addition, there are a number of apps and programs that work to help you stay on task and focused when working by eliminating distractions. Check out this list. While self-care is always important, it changes somewhat in the transition from office to home. In some ways, it can be more difficult to care for yourself, though the opposite would seem true. It is easier to stop by the gym on the way home from work than to leave home in the afternoon and hit the treadmill. It is easier to go buy a salad than to prepare one at home. Recognizing the struggle ahead of time and preparing for it is key. Plan your lunches for the week, set a time for exercise, and stick to it. You can set a time to work out at home or you can plan a time to go to the gym or go for a run. Try to avoid cabin fever as well. Make plans to go out to lunch with a friend occasionally, or try to work at a local coffee shop or library from time to time. This will help you feel less isolated. Working from home definitely has its advantages, but there is no doubt that it isn’t perfection. It can be lonely, boring, and hard to stay on task or motivated. Knowing these things ahead of time and having a plan in place to deal with them is essential to success. Good luck! Thanks for sharing all this information with us Faith. I agree with all you points – especially about being disciplined and keeping a flexible schedule – I need to follow that rule myself. I tend to skip breaks but I pay for it at the end of the day. Passing this along! Happy hump day. Great tips, especially the last one. It’s also very important to stay hydrated and of course, eat healthy. I used to drink a lot of coffee but I switched to tea and it miraculously worked just the same.